In the last post I showed you how to make yoghurt, and then how to strain the yoghurt to get your whey (and some particularly tasty cream cheese!) Now I am going to share with you some recipes for probiotic condiments. They are 100% natural, super tasty, and actually help both your digestion and your overall health. Sauerkraut – King of Probiotics! If you have ever taken or been advised to take probiotic capsules, you will know that if you want anything decent you can expect to pay rather a lot of money. I just did a quick check online and found that an organic cabbage at a medium price range British supermarket will cost about £1.40. That cabbage when shredded will make at least 1 litre of sauerkraut (I usually get about 2 litres out of a cabbage). 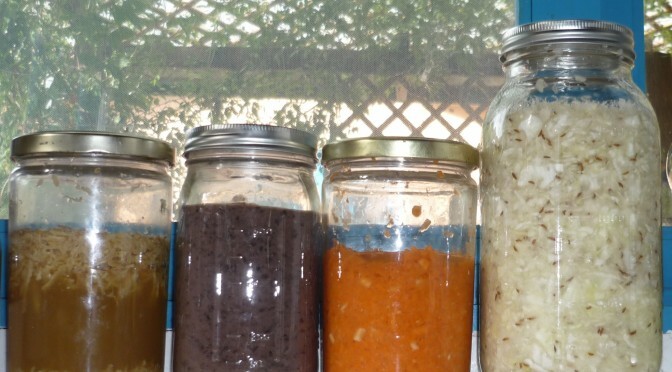 Last year Dr Mercola sent some of his home made sauerkraut to be analysed at a laboratory. The results work out that the 1 litre you can make from the cabbage will equate to about 9 bottles of 180 capsules, which I just checked on Amazon would cost about £170. You might feel uncomfortable with the notion of fermented cabbage to begin with, I certainly did. Cabbage was about bottom of my list of vegetables I wanted to eat, and pickled cabbage only dropped it further. But after hearing about the benefits of eating sauerkraut, I thought I would give it a try and it turned out to be alright. Now I am accustomed to it and enjoy it with scrambled eggs for breakfast! So, how do you make this magical elixir of life? Well, it’s pretty easy, you should be able to make 2 litres in about 1/2 an hour if you have a food processor, without one you might need a little more time. Ingredients: 1 head of cabbage (washed and cleaned), 1 tablespoon of salt, 4 tablespoons of whey* (see the previous post), 1 tablespoon of caraway seeds. *If you want to do dairy free, you can substitute an extra tablespoon of salt for the whey. Equipment: 2 litres worth of glass jars – either one big one or a few small ones, food processor or cheese grater, big knife, rolling pin, large bowl. Method: Chop the cabbage into small pieces using either the shredder attachment of your food processor (like you were going to make coleslaw) or with a big knife or cheese grater. Put the shredded cabbage in the bowl and add the salt, whey and caraway seeds. Using the end of the rolling pin (like a big pestle and mortar), bash the cabbage, taking care not to break the bowl. Keep going until you see the cabbage juice building up in the bottom of the bowl, it should get slightly foamy. Now transfer the pounded, shredded cabbage into the glass jars and push the cabbage down firmly so that the juice comes to the top. It is VERY important to leave a space between the top of the cabbage and the lid of the jar. The fermentation process usually causes the cabbage to expand, and there is a possibility of a pressure explosion, or at the very least a messy puddle around the jar. In a 1 litre jar I leave an inch of head space, the larger the jar, the more space is needed. Put the jar in a suitable place at room temperature. The fermentation process will take between 2 and 4 days, depending on how warm your location is. You will see the cabbage expand and give off some gas, then it will drop back down the jar. That is the point when I usually put it in the fridge. It will continue to ferment slowly, even in the fridge, and will keep for several weeks. Occasionally white spots of overgrowth of bacteria may form on top after a long storage. These are apparently harmless and can just be scooped off and discarded. Eggs are a really challenging subject and raw egg is even more so. My British conditioning put up so many warning flags about raw egg, I was rather reluctant to try this at first. Then there is the eggs and cholesterol thing too, and to be honest it really makes my head spin. The cholesterol issue has been largely discredited, here is just one article citing research suggesting that. My understanding is that eggs are pretty much nature’s most perfect food, and if you want to get the best out of this nutritional powerhouse, they should be consumed raw. Now, of course there are some caveats to that, and I am certainly not at the stage where I down a couple of raw eggs in the morning! For eggs to be all they can be, the chickens need to be eating a proper diet and that means true free range. They need a mix of grasses and leaves, bugs and the occasional seed. Grain fed just doesn’t work, it doesn’t give the spectrum of nutrients that a true free range egg should have. Eggs should be dirty on the outside. If they have been washed, they have probably lost their natural protective coating which stops bacteria getting in, which means they should be refrigerated. Some of the bacteria may even have got through the shell already. If your egg has chicken poo and feathers on it, take this as a good sign! Get your eggs from friends with chickens or local farmers where you can actually see the birds if you ask to. You are trying to derive the benefits from their products, why not take 5 minutes to check out where your food is coming from. It also will help you to ensure your eggs are fresh. Method: Put the egg yolk, whole egg, mustard, lemon juice, whey or salt in the blender jug. Whizz it up for about 30 seconds to allow all the ingredients to mix thoroughly. With the blender still running, remove the centre part of the lid and SLOWLY pour in the olive oil. You don’t need to be really slow, add it over 10 seconds or so. As you add it, the mayonnaise will begin to thicken. Put the mayonnaise in a jar and leave it at room temperature for about 7 hours for the probiotic bacteria to colonise. I have also eaten it straight away without issue. The mayonnaise will keep for about 10 days, but I would be very surprised if you don’t finish it before that! Most mustard here is some weird, sweet fluorescent yellow paste, but it has long been one of my favourite condiments. Mustard seeds have nutritional and medical value, although I would be surprised if any of that would apply to the fluorescent stuff. Here is a rather nice page on the benefits of mustard seeds. So, being as true English mustard was out of the question at the time, I found a little jar of Dijon mustard. It was phenomenally expensive, and really was not that good. I thought I might be able to do better. I found a basic recipe on the internet and tweaked it a bit. It proved to be a big hit. Ingredients: 250ml of ground yellow mustard seeds, 375ml of black mustard seeds, 400ml of apple cider vinegar (with the mother) 400ml of water, 150ml of white wine, 6 cloves of garlic, 1 teaspoon of ground allspice, 1/2 teaspoon turmeric, 1/2 teaspoon ground black pepper, 1/2 teaspoon sea salt, 1 tablespoon of honey, 4 tablespoons of whey. Method: Mix together the ground yellow mustard and the black mustard seeds in a bowl. Add 250ml apple cider vinegar, 250ml water and 75ml white wine, stir well and cover. You need to allow this to stand for about 2 days, stirring a couple of time per day. Make sure there is always enough liquid, you may need to add more of the vinegar/water/wine mixture, making sure you keep the ratio the same. After the 2 days, put the mixture in the food processor with the 6 cloves of garlic and process for about 6 minutes, until it is smooth and creamy, adding a little more of the vinegar/water wine blend if necessary. Put the mixture in a slow cooker and cook on low for about 4 hours, stirring occasionally. Be aware that the hot vinegar will hurt your eyes and nose if you put your head right over the pot – I speak from experience! Allow the mixture to cool to room temperature, then add the spices, honey and whey. Allow the mustard to stand at room temperature for 2 days before transferring to the fridge. You should be able to store this in the fridge for at least 6 months. In the next article, I will give the recipe for my rather awesome tomato ketchup, and some weird fermented vegetable products that may turn out to be your favourites.